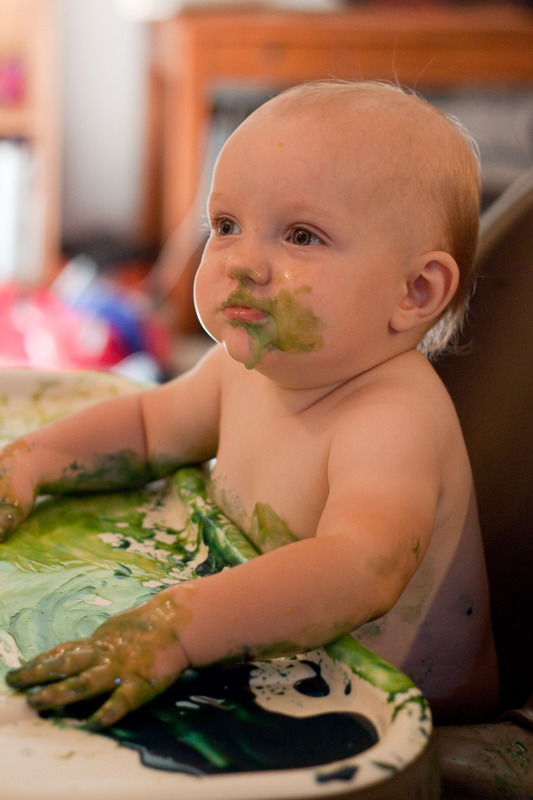 This is probably one of the simplest finger-paint recipes out there (and unfortunately I can’t remember where I first saw it, to give credit for the idea). It takes literally less than a minute to mix up, and is completely safe for the baby who tends to put everything in his mouth. 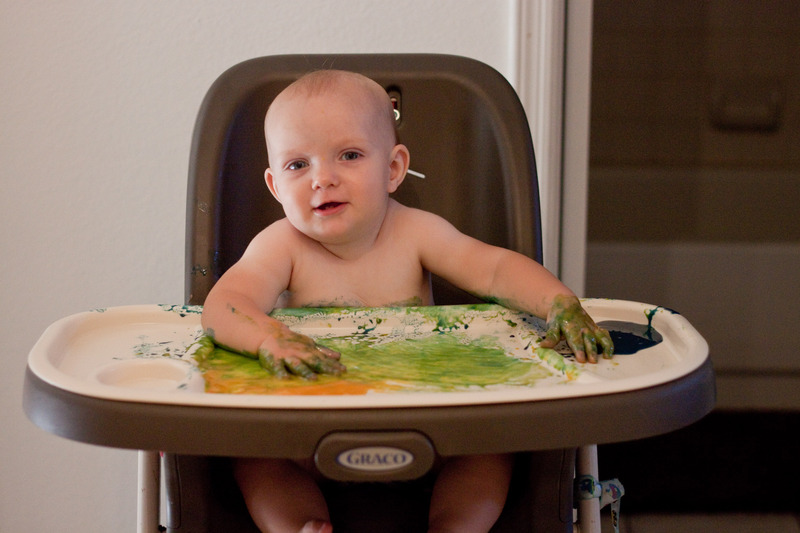 From what I remember on the original site, it does also dry well on paper, but I just used it on the highchair since only Limerick was playing with it. (Rondel was camped out on the sofa resting off a fever, poor kid). All you have to do is add some food coloring to sweetened condensed milk and voila! Perfect paint. It has just the right consistency to spread easily without running, and the colors blend together marvelously for another dimension of play and experimentation. 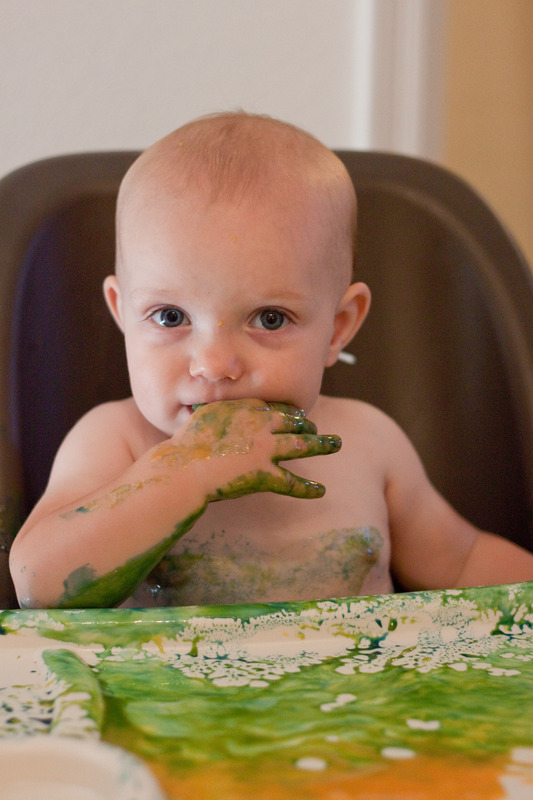 Rondel, with his sensory defensiveness, has never been a fan of messy play like this – he deeply dislikes the feel of anything slimy or sticky on his hands (he will play with drier things like dirt, sand, sidewalk chalk, and crayons, though) – so this is one of my first forays into the world of finger paint. 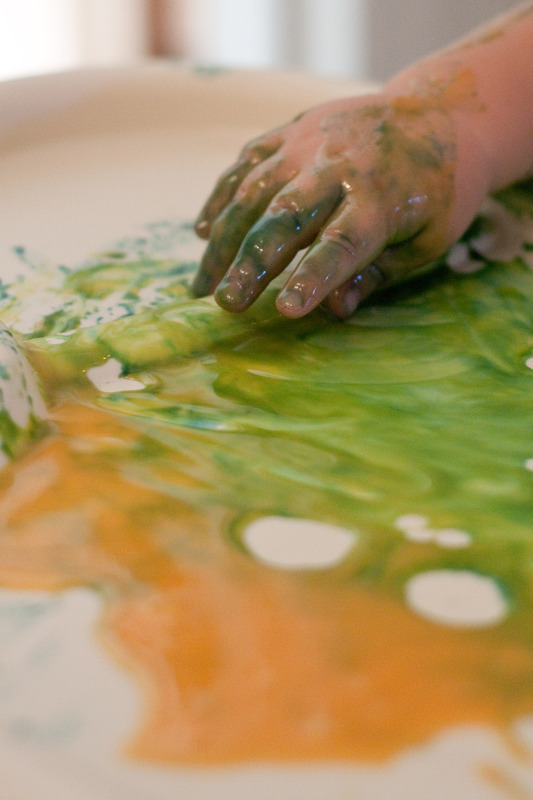 Personally I love finger painting… I love feeling different textures on my fingers and seeing things meld and change as a result of my motions. While I can rationally understand Rondel’s sensitivity and dislike, it is nice to be able to enjoy this sort of thing with Limerick! And he definitely enjoyed it. The one downside of sweetened condensed milk paint is that it is incredibly sticky. Limerick had to get a shower after this to clean it all up, and I was finding sticky drips of paint on the floor where the high chair had been for hours afterwards, despite my efforts to clean everything thoroughly right away. brilliant and so easy!!! i will have to try it! !